Explorez les hauts lieux de Santorin lors de cette visite privée de 4 heures avec un guide professionnel. Installez-vous dans un véhicule privé climatisé et découvrez tout ce qu'il faut savoir à propos de l'île, des villages blanchis à la chaux au spectaculaire littoral, dans le cadre d'un itinéraire flexible et personnalisé. Selon vos préférences, admirez l'étincelante caldeira depuis le village d'Oia perché sur la falaise ; visitez le monastère du Prophète Élie ; explorez l'ancienne capitale de Pyrgos, et arrêtez-vous dans un domaine vinicole traditionnel pour en découvrir les vins de Santorin. Choisissez un départ le matin ou l'après-midi avec transfert depuis ou vers l'hôtel inclus. We covered a lot of area however our tour guide, pleasant as he was, was not very informative or perhaps very shy. We had to ask him what some of the sights were and probed him by asking questions. Had we not asked questions, it would have been a very silent scenic drive. Fantastic - another Viator gem. MakisPronounced Marcus without the R in English was super He took us to all the sites, gave us so much information about the wonderful island of Santorini, took us to the top of the island at the monastery and we had lunch on oure own at Santo Winery. We had him join us for lunch he was such a nice guy. Even showed us his house from the mountain top. The other people on the cruise took an excursion from the ship on a huge bus and actually had very little time because of the traffic congestion. ships were in the caldera that Day, can be up to 7. Makis knew every short cut on the island giving us so much more time than those who booked thru the ship and we were only 6 people in a 12 passenger van - so basically a private tour. We even screwed up by leaving the top of the cable cars area looking for him but with one phone call he tracked us down. Just besure to give yourself plenty of time to get down on the cable cars depending how many ships are in port and what time they are leaving. Took up almost 2 hours and we thought we had given our selves enough time. Don't take the Donkeys or the trail, smelly, slippery 30 minute walk. people that did it said it was nasty and someone actually feel and broke a leg. Plus I read the Donkeys are not treated well at all. Once again Viator was great Makis Was fantastic tour guide - I highly recommend Viator! The tour was amazing and that may have been the result of the weather being magnificent. The tour guide was so knowledgeable, friendly and insightful that my wife and I found this to be one of the best excursions that we have ever experienced. We had lunch at a restaurant on the black sand beach and the food was outstanding. The advantage of the private tour over the bus tour, particularly for those with walking challenges, is that the private car tour can get closer to the sites with the best views than the tour buses. There are streets in Santorini that simply cannot be navigated in a tour bus. We loved the tour and our guide Panos was fantastic! He took us everywhere we wanted to go and we kept moving from the pickup at the old port to the monastery, to the Red and Black beaches, then Santo Winery and on to Ojai. He really took great pride in Greece and his beautiful island home of Santorini. We asked him to leave us in Ojai to explore and we ended up catching the bus back to the old port, but he made sure we got to our Caldera Spa destination first......what service! I give Panos and the tour an enthusiastic 5 Stars and would not hesitate to book again! 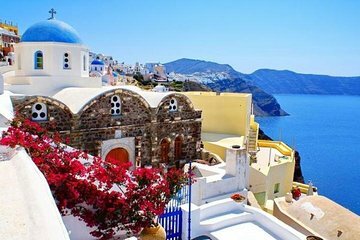 Santorini private escorted half day island tour provides quick view of whole Santorini in just 4 hours. Our driver came on time and explained well in English various area of Santorini isalnd. He is local Santorini resident and knowledgeable about the island. He explained us volcanic history of the isalnd and shown various volcanic forms - white, red,and black. Places he showed us - Oia, Black Sand beach, Red beach, Akrotiri we have to buy ticket, Perissa, Wine yard and Monastery Profitis IIias top most point in Santorini from where you can get complete view of the Santorini. He also took to photo spots which we see in magazines, movies. I highly recommend this tour. Our guide was the best! We were on a cruise ship and as we weren't taking one of the ships tours we werent given priority with tender tickets to get off the ship even after lining up for tender tickets early. So we were still waiting to get on a tender when our tour was to start. I called and they said not to worry they would wait as this happened often and were so lovely. However we got to the cable car and they wouldn't take a keycard / ATM card to pay for the cable car up to Fira town. So highly recommend having at least 20 pp in cash when you get off a cruise ship and need to use the cable car up to Fira Town as we then had to walk all the way up the steep hill that the donkeys use to take people up. Not pleasant and even thought it was winter it was hot and took us 25 minutes. So get get to then too and it's 11:30am and our lovely guide is still there waiting for us. We couldn't believe it! She'd got the message that we were late so waited. What an awesome lady. We then took a beautiful trip to the highest point of Thira Santorini and got a beautiful view from near the Monastry. Our guide had so much information and we just didn't have any questions as she answered everything before we could ask. We then went down to the other end of the island where all the picture postcard views are and had a lovely time wandering the shops and taking in the views. Again our guide was just sensational and even took some photos of us for us. We then had free time to get some lunch with recommendations on where to eat and what to have. Just a wonderful experience once we got there and highly recommend this tour. Perfect in every way. Great guide, well-organized and informative tour. We saw Santorini through the eyes of someone who loves Santorini. great guide who brought us to the best places which we would not have found,and also got great photos. Guia com excelente conhecimento, super atencioso, prestativo e muito simpático.